The Wilmington Public House and Dining - Brunch + Lunch + Dinner + 5 Ale Pumps + Prosecco on Tap + Lovely Staff PH: 020 7837 1384. 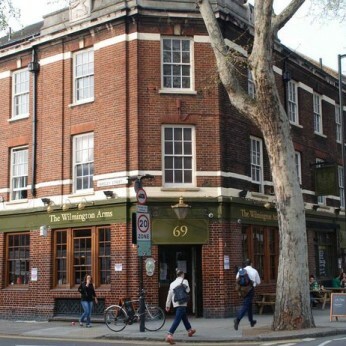 The Wilmington is a listed 19th Century public house conveniently positioned across from the food mecca, Exmouth Market, further adding to the recent developments around King’s Cross, Farringdon and Clerkenwell. The Wilmington is open for brunch, lunch and dinner from 11am Monday to Thursday, 10am on Friday, Saturday and Sundays, and aims to offer the perfect respite for local business, residents and Exmouth Market visitors alike. Following an eight week refurbishment, this former music venue has been meticulously transformed into an elegant and comfortable public house, perfect for drinking and dining at any time of the day. The team have carefully reinstated the large glass atrium, which was originally installed in the 19th Century. This impressive historic feature spans the rear dining area and highlights the open kitchen, which gives diners a preview of the action backstage.